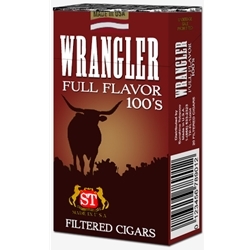 Wrangler Full Flavor Filtered Cigars are available in Box 100's and packaged 20 cigars per pack, 10 packs to a carton for a total of 200 premium filtered cigars. Wrangler Filter Cigars is fast becoming recognized for its smoothly refined and mild taste and fantastic aroma. The woodsy and herbaceous flavors make for a satisfying encounter. All Styles are available in our web store at Smokers Discounts.